New modular sheath design is now available. 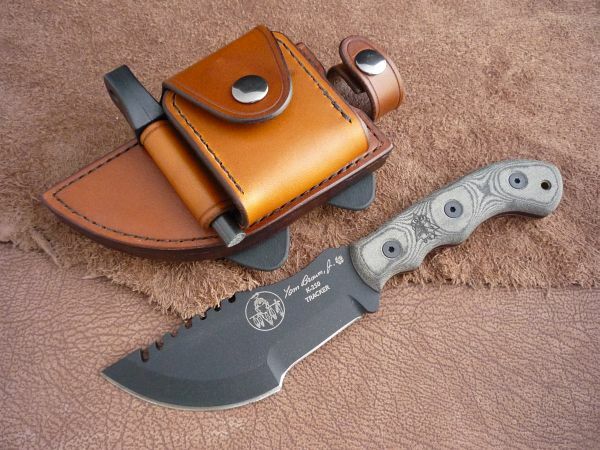 This particular one is for a Tom Brown Tracker 2, but I see so reason why the same basic design can't be applied to most other fixed blades out there. The beauty of the design is that it is completely modular and can be customized however you see fit. It can be worn left or right-handed, in any configuration on the belt (vertical, horizontal, canted, cross-draw, inverted, etc). Pouch dimensions can be modified during manufacture process to best fit your needs (it can be huge!) as it is no longer restricted by the dimensions of the sheath itself. Click the image on the left for more details, or go here. P.S. A new website is in the works, with new color chart, stamps, much-expanded gallery and more. Stay tuned. If you'd like to have a sheath made, but don't see the knife on the list, drop me an email with a suggestion. If enough folks are interested in a specific model to make it worthwhile purchasing immediately and funds are available, I'll buy one and email you back as soon as the sheaths for it can be made. Click here to suggest a knife. P.S. Yes, yes, Hinderer XM-18. I know. Looking for one, believe me. Strider PT has landed! 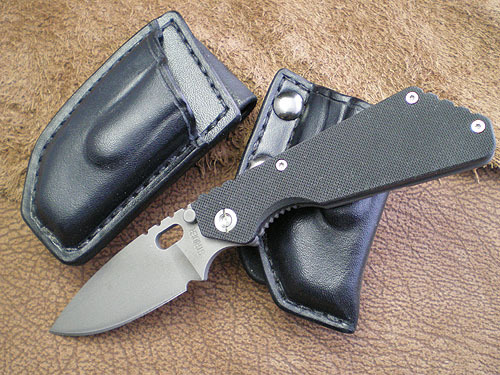 As of right now, sheaths can be made for all three major Strider folder models - PT, SNG and SMF. Also added Darrel Ralph HTM-DDR Gunhammer, which should work for custom Gunhammers as well. More Spyderco G-Clips have arrived, and I made a second trial batch of sheaths. These ones can all be worn vertically, horizontally, canted, cross-draw or any other way you like. I subdivided them into types for easier identification when placing a custom order.. Type I is the minimalistic "less is more" approach (middle sheath in the picture). Type II is the most versatile, can even be strapped to a boot with paracord with no G-Clip at all (third sheath in the picture). 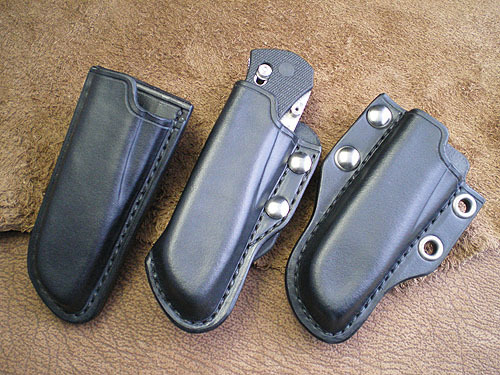 Type III is the closest to a standard sheath and looks no different from the front, works very well in all carry positions (first sheath in the picture). See individual pages below for more details. 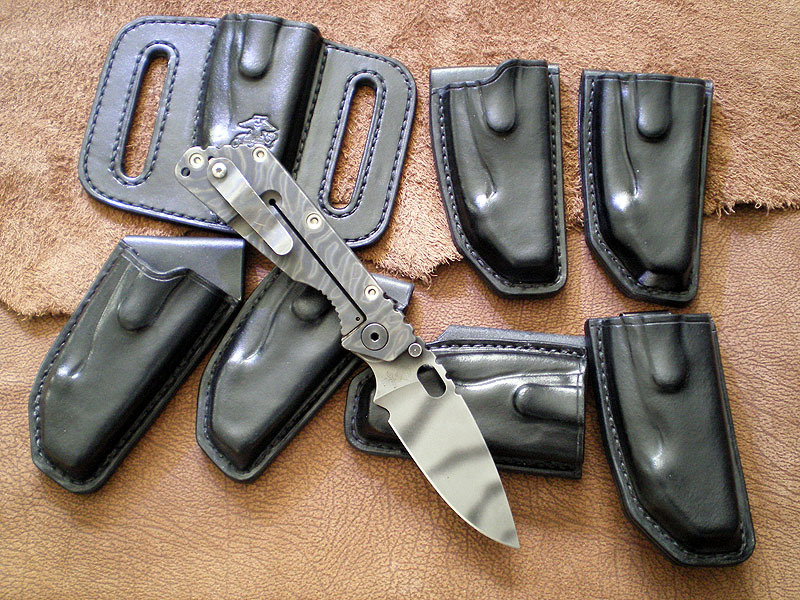 Note: Sheaths in the picture are available in the EBay Store right now. The big news is that I've began making sheaths using Spyderco G-Clips. The really neat thing about the G-Clip is that the same sheath can be worn vertically, horizontally, canted or cross-draw. Or even upside-down if you are so inclined. It even clips very securely over the waistband with no belt at all. The trial run (see picture to the left) that I've made so far is vertical/horizontal orientation only, because those are the two most popular options and I wanted the sheath to feel as stable as possible, but the future ones will be able to handle any position. Just like last summer the house is still undergoing repairs, it seems once something is patched up something else begins to fall apart. This is affecting the orders because I hardly ever manage to get any work done on the weekends, but that should return to normal in the Fall. Long time since last update, but very busy as usual. The big news is that black cherry toad skins are back! They were out of production and unavailable for several years, but finally I've found a supplier that carries them. Also new, British tan toad - lighter and more reddish than black cherry. As well as python print snake skin - beauty and texture of python without import hassles. CRK Umnumzaan and Spyderco Stretch should be in within a month as well, end of February or mid-March at the latest. Now, for the bad news. Our shipping prices have not been changed in years, but CanadaPost has had three price increases in that time period, last one this January. As such, I will have to increase the shipping prices slightly. Airmail, 6-10 day with insurance that used to be US$6.40 will be US$7.90, for example. This is unfortunately unavoidable. Also purchased a USMC insignia stamp and the US Army insignia stamps. We have been very busy over the past year, so website and EBay store updates took a back seat to custom orders. As usual, every summer the frequency of orders drops off a bit, before picking up again during the Fall and turning into the usual holiday madness. So to answer a few emails, yes we are still around, and yes we still make sheaths. And a few more that escape me at the moment. We are now taking orders on custom leather archery items, such as quivers and arm guards. Another maker in the same workshop. 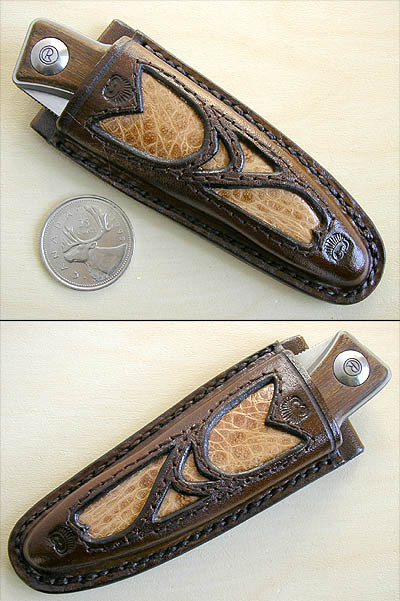 Western diamondback rattlesnake inlay, classic construction, and a section for small knives on the back. This is a small vertical belt/pocket sheath, made from cowhide, lined with pigskin on the inside front and inlayed with a cane toad skin. This is a small wallet with an ID window on the front, compartment for credit cards in the middle, and a CRK Mnandi sheath and a change pocket on the back.